Professional Roofing in Easton: Choose the Best Type of Roof | Boss Services Inc.
What’s the best type of roof for your house? Whether you are looking to update your existing roof with brand new Easton roof installation, or if you are in the middle of building a brand new home and are thinking about customizing with a superior product and professional roofing services, you need to learn all you can about the different types of roofing available in Massachusetts. Before you just allow the construction supervisor on your Easton construction and remodeling project to choose the materials for you, make sure to consult with Boss Services, Inc. to get the best solution for your home. The biggest mistake that you can make is to choose your roofing materials based solely on the cost. While everyone has a budget that can restrict them from getting the top-of-the-line roofing products or professional roofing services, it is important not to “go cheap” when it comes to your roof. Think about it, your roof protects the rest of your home. It protects your home in a storm from the wind and the weather, don’t you think you should take just a little time to make sure that you choose the best material that you can afford? One way to pick the best material is to examine the common problems associated with each type of material. This can help you to see what would work in your area, and what wouldn’t. There are a lot of different types of materials used by professional roofing services throughout the northeastern states. 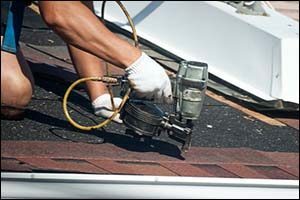 Roofing can range from composite materials to asphalt shingles, flat roofs to pitched roofs, metal roofing and wood shake roofing, plus a lot of other unique materials in between. The type of roofing materials that are best for your house should be chosen based upon the design, style and location of your home. For example, a home in Florida would have much different needs for roofing than you will need in your Easton roof installation. Make sure to consult with a certified construction supervisor who understands the needs of roofing in Massachusetts. Asphalt Shingles – Common issues faced by homeowners who have asphalt shingles can be individual shingles that blow off or lift up during extremely strong weather conditions. Much has changed in Easton construction and remodeling with regard to Asphalt shingles, as many of today’s materials are designed to withstand winds of up to 110 miles per hour. As with other types of roofing materials, the installation is what really makes the difference with these products. Professional roofing services through experienced providers like Boss Services Inc., are able to do a proper Easton roof installation that will last much longer than roofing that was put on just ten years ago. Composite Shingles – Compared to asphalt shingles, this material is much more light weight. Therefore, it is much more likely to be damaged during high winds and extreme weather. While you might lose a shingle or two during a storm with a traditional asphalt shingle roof, you could lose an entire section of a composite shingle roof under the right conditions. This material will lift up much more easy than asphalt shingles, allowing water to blow in underneath and get into your home. The advantage to composite shingles is that they are inexpensive and provide an early warning signal, in that the stone granules on the shingles will begin to fall off or come off easily when the product wears out. Flat Roofs – While popular in many regions throughout the United States, there are many inherent problems with flat roofs. As they begin to age, they develop sags. These sagging areas can allow water to pool instead of flowing off of the structure and into the drains. Metal Roofs – If the shingles or panels of a metal roof have been removed at any time, it can cause a possible “leak point,” if they are not sealed properly afterwards. The fasteners that hold the panels on can also become loose over time, particularly if there is a lot of contraction and expansion in the roofing material. The seams between the shingles or panels can also become loose over time, allowing water to get into the home, requiring major work by Easton construction and remodeling services. Slate Tiles – While this material is held on by nails, it is a delicate installation process. If the nails are too loose, they will come undone, causing tiles to become loose and fall off. If the nails are too tight, leaks can form when the edges stick up as a result. This type of Easton roof installation is prone to the formation of ice dams, which can result in a lot of interior damage, as well. If you are in the market for a brand new roof or require professional roofing services in the Massachusetts area, contact Boss Services, Inc. by calling (508) 297-0635. Our crew of highly trained and experienced construction supervisors and installers can help you choose the best roofing solution for your home. Call today to get a quote on Easton roof installation for your new or existing home.